The Send is an epic, day-long stadium event that will draw more than 60,000 people to the Camping Stadium in Orlando, FL on February 23, 2019. 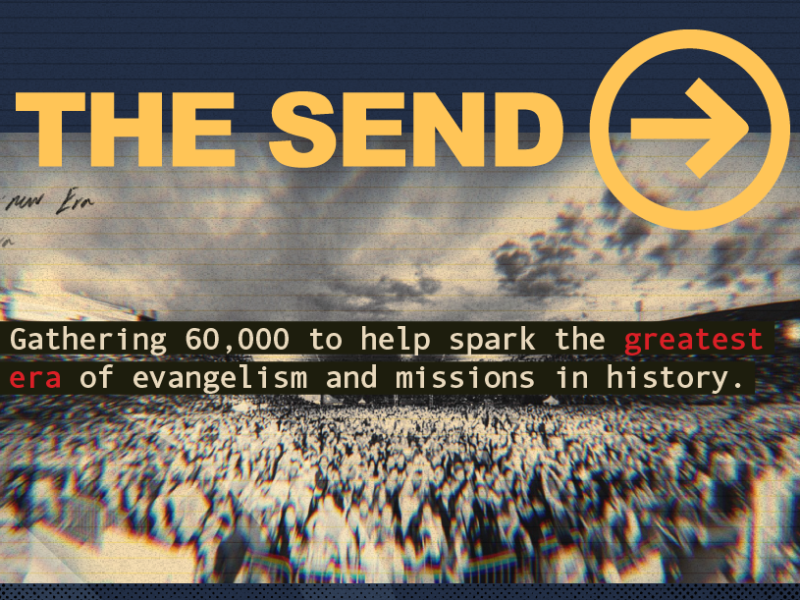 The heart behind this tipping-point gathering is to help spark the greatest era of evangelism and missions in history. Now is the time to catalyze action – to inspire everyday Christ-followers to share the Gospel in their everyday lives. If every believer in America lead just one person to Jesus this year, the Church would grow by more than 100-million people. An unbelievable line-up of speakers and worship teams will help impart this fresh passion for evangelism. Featured speakers include, Christ for all Nation’s (CfaN’s) Lead Evangelist Daniel Kolenda, as well as Lou Engle, Andy Byrd, Michael Koulianos, Brian Brent, Todd White, Heidi Baker, Francis Chan, Bill Johnson, Loren Cunningham, Mike Bickle, Claudio Freidzon, Teo Hayahsi, Marco Barrientos and many more. In light of that commitment, CfaN will host a table in the (FIND MY MISSION) area, where anyone can learn how to connect with the ministry, serve overseas, and take part in this Spirit-led movement. Amazingly, the event is completely free! Some spaces are still available, but registration is required, and individuals, groups and churches are encouraged to sign up soon. For more information, visit www.thesend.org. Founded by Evangelist Reinhard Bonnke in 1974 and now led by Evangelist Daniel Kolenda, Christ for All Nations (CfaN) continues to pioneer mass-evangelism in Africa and beyond and to equip the church to fulfill Christ’s Great Commission. To date, more than 78-million people have chosen to follow Jesus at a CfaN Gospel Outreach Campaign – meetings marked by supernatural displays of God’s power to heal bodies, restore lives and change communities. With offices in Australia, Brazil, Canada, Germany, Hong Kong, Singapore, West Africa, South Africa, United Kingdom and United States. CfaN produces written, musical and video content that can be found online and seen daily on TV stations around the world. To learn more about Christ for all Nations, visit CfaN online at www.cfan.org.